2015 Update: Added the 2015 Seiko SCED “Ripley” reissues! For “Aliens”, director James Cameron wanted to create a familiar yet futuristic vision of the future. Along with spacecraft and guns based on real-world objects, Cameron outfitted the colonial marine party with Seiko watches. Most famous of these are the silver and black 7A28-7000 worn by Ellen Ripley and the 7A28-6000 worn by the android Bishop. In fact, these models have become known as the “Ripley” and “Bishop”, respectively, and are highly sought-after collectibles. For what it’s worth, the rest of the colonial marines wore digital Seiko S234 Pulsemeters. While the buttons on the Ripley models proved troublesome, the Bishop chronographs were well-loved by collectors. Their distinctive styling isn’t quite so radical as the PloProf-like Ripley, it has enough flair to draw comments. 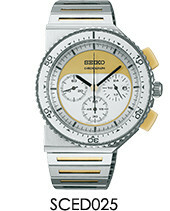 Inside the original Giugiaro models was Seiko’s respected 7A28 quartz analog chronograph movement. This was actually the first analog quartz chronograph ever made, predating the better-known Swiss Jaeger-LeCoultre “Mechaquartz” Calibre 630 and Frederic Piguet 1270 “Meca-Quartz” by a few years. It’s a well-made all-metal jeweled movement with individual stepper motors for each hand. Read more here or check out the 7A38 site! With all the interest in the 7A28 among modern Seiko collectors, it was only a matter of time before Seiko created a homage to the line. Now they’ve done that three years in a row! The first reissue or homage to the 7A28 Aliens line appeared in 2013. The SCED003 is the most direct copy of the original “Bishop” watch, but a wide variety of other combinations was created as well. 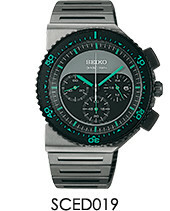 In all, there were six SCED watches issued by Seiko in 2013, with four available as a series of 500 and two being very rare, only for sale at Tic Tac in Japan and limited to just 200 examples. This series uses the modern 7T12 movement, which isn’t quite up to the standards of the 7A28. For starters, it’s a mass-produced movement with plastic parts and not meant to be serviceable. It’s also lower-spec than the 7A28, with 1/5 second chronograph timing rather than 1/10 and lacking the split-seconds feature offered by the 10:00 button on the original. It’s an acceptable movement, but not in the same league as the 7A. On the other hand, the cases appear to be very well made. All are stainless steel, and four of six are coated in a black super-hard material. Although it’s apparently not PVD, it does have that look. Hopefully Seiko also solved the cracking and splitting issues the original plastic buttons had. In the interest of posterity, I’ve saved photos and specifications from Seiko’s 2013 Giugiaro Spirit web site. These watches are quite hard to find even just one year on, and the SCED009 and SCED011 are exceptionally rare: I didn’t even find a photo of those on Google! 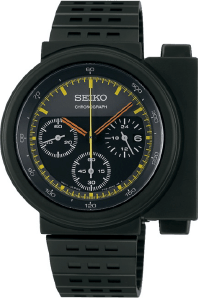 For 2014, Seiko again reissued the Giugiaro watch lineup as a limited edition in the Spirit line. Although we have different colors and much higher production numbers, the watches are essentially the same as the 2013 models, complete with the 7T12 movement. Of these models, the SCED023 is most eye-catching to me, though the blue and black SCED021 is pretty cool too. None matches Bishop’s watch from Aliens, but that’s what the SCED003 was for! Although 2,500 of each model were released, they were already becoming hard to find by 2016. Our go-to Japanese sources like Seiya Japan are out of stock. 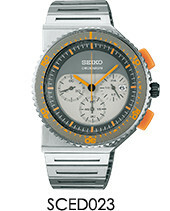 Late in the year, Seiko again released two special editions for the Tic Tac Stores of Japan. These are limited to 300, for the SCED029 and likely the same for SCED027 and are extremely rare. And pretty ugly in my opinion. 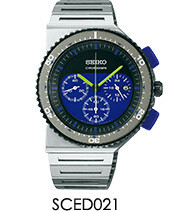 Two more special editions were also created: SCED031 was limited to 200 and produced for the On-Time watch store, while SCED033 was limited to 700 and produced for the White Mountaineering specialty clothing retailer of Japan. 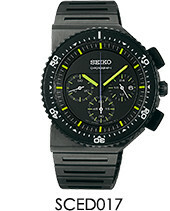 For 2015, Seiko turned to the “Ripley” Giugiaro watches. These are the most hotly-anticipated, since Ripley’s 7A28-7000 gets more screen time than Bishop’s watch. Once again, Seiko uses the lower-end 7T12 movement. The SCED035 is an almost-perfect match for Ripley’s watch, so I expect it will sell quickest! Just 3,000 of each model were released, and Seiya Japan already lists them as “out of stock” as of December 2015. Three more variants were soon released, SCED039, SCED041, and SCED043. Each was limited to 2,000 examples. Limited editions followed. SCED045 and SCED047 were limited to 300 pieces for Tic Tac stores. The Beams clothing brand got the SCED049, also limited to 300 pieces. And White Mountaineering got another model, SCED051, limited to 1,000 pieces. 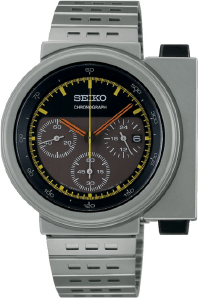 Note: All photos taken from the Seiko Spirit Giugiaro web site or are official Seiko press photos. Thanks for the little plug, Stephen. Reciprocated. These “Aliens” are so exceptionally designed, extremely impressive sport watches, Seiko is the No.1 Innovator in the watch industry, along with Citizen. Does anybody know a value?